This discussion concerns a survey I posted on Crooked Timber (the group blog of which I am a member) and Lifehacker (where I guest-blogged last week). Second, thanks to the 784 readers of CT who took the survey. Read on for more. This entry was posted on Wednesday, September 7th, 2005 at 9:29 am	and is filed under IT/Comm. You can follow any responses to this entry through the RSS 2.0 feed. Both comments and pings are currently closed. 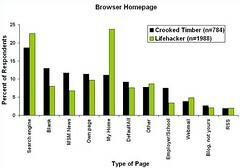 What is your homepage and why? Jason, I am assuming you’re asking me the question. Since I decided to check out SessionSaver as mentioned in the post my browser opens up to whatever was open before, which means a bunch of tabs since I use tabbed browsing in Firefox.